Cortland “Trout Boss” fly line in moss. The line is also available in orange. Trout are wily, so if you’re targeting them it’s wise to equip yourself with the best gear you can get your hands on, and to my mind, the most important piece of gear is not your rod or reel—it’s your fly line. I recently fished Cortland’s new fly line, the Trout Boss. It’s a 100-footer that sports a 65-foot head (but is AFTMA standard at 30 feet). That long front belly allows you to hold more line in the air and can translate to exceptionally long casts. It loads smoothly and consistently, and is perfectly suitable for longer leaders and accurate, delicate presentations. 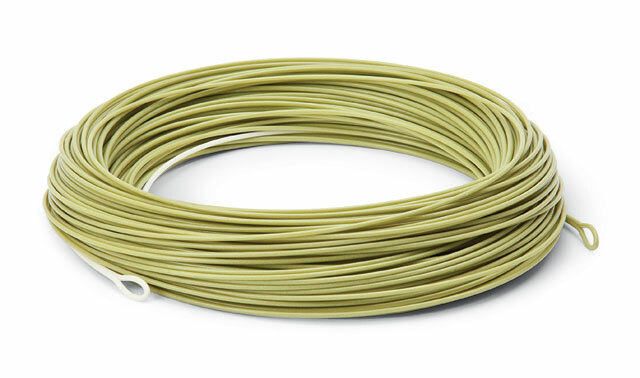 If your casting basics are in order, this line will allow you to lay out 40- to 50-foot roll casts with pinpoint precision (this accomplished with flies as bulky as small streamers), and perform long-range mends with relative ease. Recasting with just 10 to 12 feet of line off of the rod tip was a cinch, also courtesy of that taper recipe. Being able to cover a large trout stream, with a high degree of line control, and without having to resort to a back cast is reason enough to keep a Trout Boss handy. The line jacket also sets this line apart. It’s made with both hard and soft polymers, said to dissipate heat and have low jacket memory when fished in cold waters. Overall, it shoots well, lays out straight and, thankfully, has near zero stretch. For a long time, I’ve complained loudly to line manufacturers for making their lines too elastic and I’m pleased that the issue has been addressed by some. Overall, the line delivers a hard-enough finish, but allows that critical ability to make a soft presentation. Other key features: 18 inches of Dynatip, a low-density material which ensures the tip of this floating line really does float, and welded loops (both ends). I tested the line using a traditional (softer) rod and new-school rod and it synced up very well with both, requiring just a little adjustment to my casting arc. However, I would recommend that the line be used with longer rods: 8’6” and up—once again, due to the extra long head. One problem with gear reviews in general is that they rarely address product toughness/durability, so I always snip off a short section of running line and perform an admittedly unscientific abrasion test, this includes wrapping the line around rough (but not sharp) rocks and “flossing.” The Trout Boss can handle more than a little abuse and still remain fishable. Examine the taper and jacket recipes, and you can easily see that Cortland really stuck its neck out and took a risk producing this line. That risk has paid off. As of this moment, I can think of only two companies that are really pushing the design and performance envelope of fly lines—Cortland is one of those companies. Trout Boss comes in 3 to 8 weight, floating, and retails for $75.